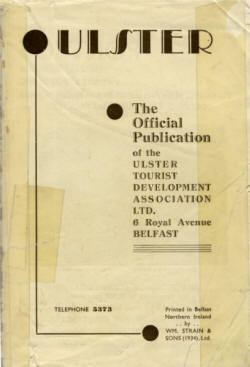 of the Ulster Tourist Development Association Ltd.
PREMIER PORT AND GATEWAY OF IRELAND. Ideal Ocean Terminal and Distributing Centre. Quays connecting with all parts of Ireland. for vessels up to 48,000 tons gross. Unrivalled facilities for rapid and efficient Ship Repairs. SPECIAL WHARF FOR OIL TANKERS. Excellent Waterside Sites for Industries. Prime Minister of Northern Ireland. To the prospective visitor this Guide Book holds out a promise of much pleasure and happiness, which, I am confident, Ulster is able richly to redeem. A great deal is known about our shipyards and our linen, thread and ropework factories, all the world has heard of them, but you may not have been told of the restful beauty of our landscape, and of the scenic grandeur of our coast and inland excursions. As a matter of fact the Province offers scenery in infinite variety ; it is rich in stirring historical associations, and its myths and legends, still alive, add considerably to the interest of the countryside. Ulster is predominantly agricultural, but even in the capital City of Belfast, the industrial centre of the Province, one is never out of sight of the hills, and it is so compact that from its boundaries it is possible almost everywhere to step abruptly from town to country. COURTS OF JUSTICE HOUSES OF PARLIAMENT, STORMONT. It is not for me to enumerate or enlarge upon the attractions of Ulster to the holidaymaker ; the Guide will do that for you. It will tell you of wild, rock-bound coasts, of peaceful strands, of sandy shores, of picturesque villages, dignified towns, of Lough and mountain, of glen and salmon stream. My part is simply to extend to you, on behalf of my countrymen and women, a cordial welcome to Northern Ireland, of which you may be assured. Hospitality of the sincere, if not the demonstrative kind, is a tradition of Ulster, and one most precious to its sons and daughters. Finally, I would remind you who hail from England, Scotland or Wales, that in coming amongst us you will not have left your home country, for we form with you the United Kingdom of Great Britain and Northern Ireland. You will not, accordingly, be worried with anything in the shape of Customs' formalities, passports or motor car regulations ; you will travel under exactly the same conditions as you would in any other part of the United Kingdom. THE expression " Ulster," prior to 1920, was applied to the Northern Province of Ireland, and included nine counties. Since the passing of the Government of Ireland Act, 1920, the six counties of Antrim, Armagh, Londonderry, Down, Fermanagh and Tyrone, with the County Boroughs of Belfast and Londonderry, have been statutorily constituted as a self-governing area, known as " Northern Ireland," leaving the remaining twenty-six counties comprised in the Irish Free State. To all intents and purposes, however, the traditional name of " Ulster" and the new political term " Northern Ireland " are synonymous in the public mind. This newly created " Northern Ireland " was by the same Act granted a form of autonomous government, but closely linked with Great Britain in the Fiscal Union known as Great Britain and Northern Ireland. We in Ulster�to revert to the more homely term�are therefore subject to the same rates of taxation and financial obligations as apply to our fellow-countrymen in England, Scotland and Wales. There are no special ordinances to regulate the importation of Motor Vehicles, nor are there special customs duties to restrict the free entry of merchandise or postal packets. The same postage stamps and the same coinage�which, by the way, visitors will find goes a little further in Ulster than in Great Britain�are used ; in fact, Ulster is in all respects in the same position as any part of the United Kingdom, and the trading relationships which exist between Great Britain and Ulster are exactly the same as those which exist between Lancashire and Yorkshire. The area is 5,237 square miles, and the population proximately 1,300,000. 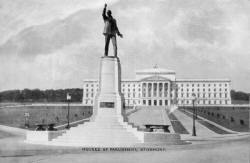 The capital and seat of government is the City of Belfast, with a population of over 430,000. The Parliament Buildings, which were opened on November 16th, 1932, by His Royal Highness the Prince of Wales, are beautifully situated in the outskirts of the capital at Stormont. Climate.�The climate is surprisingly mild and equable when compared with that of other areas in the same latitude, the average temperature being higher in winter and somewhat lower in summer. the Antrim and Londonderry coastline is exceptionally bracing, and the County Down coast, particularly in the Mourne area, is noted for its exceptional mildness. The rainfall is relatively small, and Ulster is recognised as the dryer corner of Ireland. Ulster Year Book.�Readers desiring a complete treatise of the social, political and economic life of the people of Ulster are referred to the Ulster Year Book, a most comprehensive volume, which can be had from H.M. Stationery Office, 80 Chichester Street, Belfast, price 1 /- net. (By post, 1/3). Liverpool-Belfast. � Daily (Sundays excepted). Liverpool dept. 10-15 p.m., Belfast arr. 7-30 a.m. ; Belfast dept. 9 p.m. (Satys. 11 p.m.), Liverpool arr. 6-30 a.m. It is intended to have a sailing from Belfast to Liverpool at 9-30 a.m. each Saturday from July 6th till August 31st. Heysham-Belfast. � Daily, Sundays included. Heysham dept. 11-40 p.m. (Sundays, 11-30 p.m.), Belfast arr., 6-30 a.m. ; Belfast, dept. 9-45 p.m. (Satys. 11 p.m.), Heysham arr., 4-45 a.m. (Sundays 6-30 a.m.). Additional summer service from Belfast on Saturdays 6th July till 31st August inclusive. Belfast dept. 10 a.m., Heysham arr. 5 p.m. The details regarding Cross-Channel Services given above are those available at time of going to Press, and should be confirmed. Stranraer-Larne.�(Short Sea Passage). Daily (Sundays excepted). Stranraer Harbour dept. 6-5 a.m., Larne Harbour arr. 8-15 a.m. ; Larne Harbour dept. 7-5 p.m., Stranraer Harbour arr. 9-5 p.m. Additional Summer Service (Weekdays 1st June till 14th Sept. inclusive). Stranraer Harbour dept. 7-5 p.m., Lame Harbour arr. 9-15 p.m. Larne Harbour dept. 10-15 a.m., Stranraer Harbour arr. 12-15 p.m. The following sailings will also operate on Fridays and Saturdays during July and August :�Stranraer Harbour dept. 1-30 p.m., Larne Harbour arr. 3-40 p m. ; Larne Harbour dept. 3-5 p.m., Stranraer Harbour arr. 5-5 p.m.
Glasgow-Belfast. � (Direct). Daily (Sundays excepted). Glasgow dept. 9 p.m. (Satys. 10-45 p.m.), Belfast arr. 8 a.m. ; Belfast dept. 9 p.m. (Satys. 9-45 p.m.), Glasgow arr. 8 a.m.
Glasgow-Belfast.�(Via A r d r o s s an). Daily. (Satys. and Suns. excepted). Glasgow (Cent. Stn. ), dept. 10-30 p.m., Belfast arr. 5-45 a.m. ; Belfast dept. 9-45 p.m., Glasgow (Cent. Stn.) arr. 5-20 a.m.
Daylight Service from 1st June till 14th September : Glasgow (Cent. Stn. ), dept. 8-30 a.m., Ardrossan dept. 9-45 a.m., Belfast arr. 1-45 p.m. ; Belfast dept. 4 p.m. Ardrossan arr. 8 p.m., Glasgow (Cent. Stn.) arr. 9-6 p.m.
Glasgow-Londonderry.�(Direct and via Greenock) Mondays, Wednesdays, Fridays and Saturdays. Passengers are respectfully referred to the daily advertisement in the " Glasgow Herald " for days and hours of sailing, etc. From Londonderry�Dept. 6-30 p.m. Mondays, Wednesdays, Thursdays and Saturdays. As the sailing days to and from Londonderry are subject to alteration, passengers are requested to verify them at the Company's offices. The details given above are those available at time of going to Press, and should be confirmed. London (Euston) dept. (Sundays excepted) 8-45 a.m. ; Holyhead dept. 2-30 p.m.; Kingstown Pier arr. 5-25 p m. ; Belfast arr. 9-25 p.m. Euston dept. 8-45 p.m..; Holyhead dept. 2-55 a.m.; Kingstown Pier arr. 5-50 a.m. ; Belfast arr. 9-10 a.m. (Sundays 8-50 a.m.). Belfast dept. 5-40 p.m. (Sundays 5-10 p.m.); Kingstown Pier dept. 8-50 p.m.; Holyhead arr. 11-45 p.m.; London (Euston) arr. 5-30 a.m. 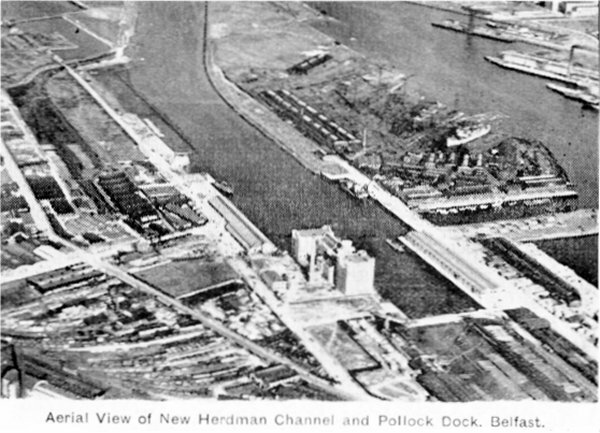 The L.M.S., L.N.E.R., and Cheshire Lines Committee connect with Northern Ireland via Liverpool, Heysham or Holyhead, and the G.W.R. via Birkenhead and Liverpool. L.M.S. and L.N.E.R. also connect with Northern Ireland via Glasgow and Stranraer. Fares.�The following example fares clearly indicate the cheapness of travelling to Ulster from any part of Great Britain. For further specific information as to fares, etc,, apply to your Local Stationmaster or Railway and Steamship Agent. The foregoing fares refer to Holiday Excursion Tickets which are issued from the principal stations in Great Britain to Belfast and principal stations in Northern Ireland every Friday and Saturday, also on Sundays via Heysham and via Holyhead, and are available to return any sailing day up to and including the Monday fort-night following date of outward journey. In addition to these fares intending visitors, if they wish to stay for longer than a fortnight, can take advantage of monthly return tickets where in operation, or Tourist Tickets, available for three months. Intending visitors should apply to their local Stationmaster or Booking Office for full information. Single Berth Cabin 7/6 "
Berth in two-berth cabin 2/6 "
Passengers travelling to Ireland by the 6-5 a.m. sailing can be accommodated overnight on board at Stranraer (Saturdays excepted). Stateroom (one person) 15/- "
Berth in 2 berth cabin, decks "A" & "B" 3/9 "
CABINS�Passengers may occupy cabins on the voyage Larne to Stranraer, or vice versa. The charges are 10/- and 6/-. The ordinary sleeping berth rooms, when available, may also be had for use on the voyage at a charge of 5/- for a single berth cabin, and 2/6 for a berth in a two-berth cabin. 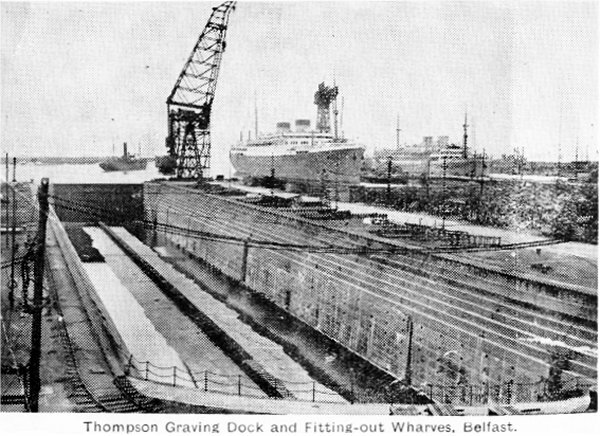 On Disembarking.�Passengers who wish to make a train or bus connection are facilitated by special free Omnibus Services from Donegall Quay, Belfast, to the Gt. Northern Railway (I.) and London Midland and Scottish (N.C.C.) 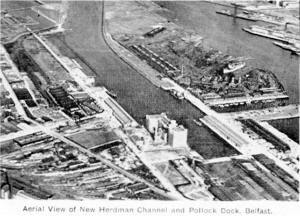 Railway Termini and Bus Depots, and to the Depots of the Belfast Omnibus Co. Ltd., and H.M.S Catherwood, Ltd. The Belfast and County Down Railway Station is situated at Queen's Quay, about five minutes from steamers. Passengers travelling via Stranraer to Great Northern Railway (I.) Stations are conveyed free of charge in Belfast from York Road Station to Great Victoria Street Station on arrival of morning Boat Train from Larne Harbour. There is also a free service in connection with the evening Boat Train from Belfast. Trains run alongside steamer at Kingstown and Holy-head, also at Heysham and Stranraer, whilst at Liverpool passengers and their luggage are conveyed free between railway termini and the ships. Luggage in Advance.�Luggage may be booked through from stations in Great Britain to Belfast and stations in Northern Ireland at a charge of 2/- per package, which includes collection and delivery within the usual cartage boundaries. There is a supplementary charge of 6d. per package to places served by the Belfast and County Down Railway. Interavailability of Tickets.�In certain cases tickets issued by one route are available to return by another, but visitors should obtain full information on this point before purchasing travelling tickets, as any misunderstanding may lead to confusion and possibly additional expense. MOTOR CARS�Weight not exceeding 10 cwts. 60/- ; from 10 cwts. to 15 cwts. 65/- ; from 15 cwts. to 20 cwts. 70/- ; each additional cwt. or part 2/-. MOTOR CYCLES�Solo, up to 120 lbs. 8/11 ; up to 200 lbs. 11 /- ; exceeding 200 lbs. 13/2 ; Motor Cycle with Sidecar, 19/6 ; Bicycles, 4/5. Motor vehicles must be at the quayside as follows :�Liverpool 8-30 p.m.; Belfast, Monday to Friday, 7-30 p.m. ; Saturday, 6-30 p.m.
Heysham - Belfast.� Owner's risk�MOTOR CARS (Port dues included) not exceeding 10 cwt., 56/3, plus 1 /6 for every cwt. or part cwt. over 10 cwt. Company's Ordinary risk�Not exceeding 10 cwt. 63/9, plus 1 /6 for every cwt. over. Company's risk�Motor Cycles (Port dues included), not exceeding 120 lbs., 7/9 ; exceeding 120 lbs., but not exceeding 200 lbs., 9/6 ; exceeding 200 lbs., 11 /3 ; Sidecars (detached) 9/6 ; Bicycles 3/8. Motor vehicles must be at the quayside as follows :�Heysham, 9 p.m.; Belfast, 8 p.m.
Stranraer-Larne.�MOTOR CARS (Port dues included). Owner's risk�Not exceeding 10 cwt. 45/6 ; over 1 and not exceeding 25 cwt. 60/6 ; over 25 cwt. 60/6, plus 1 /6 per cwt. additional for each cwt. or part thereof over 25 cwt. Company's Ordinary risk�25% over owner's risk rate. MOTOR BICYCLES. (Port dues included). Company's risk�Not exceeding 120 lbs., 5/11 ; exceeding 120 lbs., but not exceeding 200 lbs., 7/� ; exceeding 200 lbs., 8/2. Sidecars (detached), 7/� ; Bicycles, 2/5. Motor vehicles must be at the quayside as follows :�Stranraer, 1 hour before sailing time ; Larne, 11 hours before sailing time. Burns & Laird Lines, Ltd. Motor Cars. Motor vehicles must be at the quayside as follows :�Glasgow by pre-arrangement with 52 Robertson Street, Glasgow ; Ardrossan, 9 p.m. ; Belfast, Monday to Friday 6-30 p.m. ; Saturday 12 noon. By all routes, privately owned Motor Cars, accompanied by not less than two adult passengers holding return tickets, are charged at the rate of Single Fare and One Half for the double journey. Hillman's Airways, Ltd. (Headquarters, Essex Air-port, Stapleford, near Abridge, Essex), operate daily, except Sundays, between London, Liverpool, Belfast and Glasgow. Fares :� Single Return Ex. Baggage. London-Belfast �5 �8 9d. per lb. Liverpool-Belfast �2 10s �4 6d "
Glasgow-Belfast �2 �3 5s 6d "
33 lbs. baggage carried free, subject to permissible load of Air Liner not being exceeded. The above fares include road transport between Air-ports and the following terminals :�London, King's Cross Coaching Station (1 hour) ; Liverpool, G.P.O. Sorting Office, Victoria Street (20 minutes) ; Belfast, Grand Central Hotel (30 minutes) ; Glasgow, 381 Argyle Street (30 minutes). Services.�Dept. London, Essex Airport 10 a.m. ; dept. Liverpool, Speke Airport 11-20 a.m. ; dept. Belfast, Newtownards 12-35 p.m. ; arr. Glasgow, Renfrew Airport, 1-35 p.m. Dept. Glasgow, Renfrew Air-port, 8 a.m. ; dept. Belfast, Newtownards, 9-15 a.m. ; dept. Liverpool, Speke Airport, 10-45 a.m. ; arr. London, Essex Airport, 12-5 p.m. The Railway Air Services also operate a daily service, except Sundays, between London, Liverpool, Belfast and Glasgow ; London to Northern Ireland in 3 hours. For further information apply to any L.M.S. Station or Enquiry Office. Entry from Irish Free State and Abroad.�All persons disembarking at an Ulster port from abroad are subject, of course, to the customary British formalities. This also applies to persons entering Ulster from the Irish Free State, and for routes of entry see chapter " Motoring in Northern Ireland," "Table of Approved Roads," also the map at the back of this Guide. Passengers travelling to Northern Ireland from Great Britain via Dublin (Holyhead-Kingstown route), in order to avoid the inconvenience of Customs examination, can have their luggage placed in a sealed compartment provided on the Holyhead boat. On arrival at Kingstown Pier the luggage is there transferred to a sealed compartment on the connecting boat train for stations in Northern Ireland. The sealed compartment is opened at Goraghwood and the luggage is then available for passengers detraining at that station, or at Portadown or Belfast, according to the destination of the owner of the luggage. Similarly, in the reverse direction, passengers travelling from Belfast, Londonderry and Northern Ireland stations generally to Great Britain can have their luggage placed in a sealed compartment provided on the 5-40 p.m. boat train from Belfast, 6-17 p.m, train from Portadown (with which the 4-10 p.m. train from Londonderry connects), and conveyed direct to Kingstown Pier, after which the luggage will be placed in a sealed compartment on the Holyhead boat. On Sundays the arrangement applies by the 5-10 .m. train from Belfast, and the 6-10 a.m. train from Kingstown Pier. Sealed vans are also provided for the luggage of passengers travelling from Belfast via the Great Northern Railway to stations in Co. Fermanagh via Clones (I.F.S. ), the line en route passing through a portion of the Irish Free State. Importation of Dogs.�No quarantine is necessary for the importation of dogs from Great Britain unless a special embargo is in force at the time, but animals arriving for first importation from foreign countries are subject to the usual British regulations, i.e., six months quarantine in Great Britain, as there is no quarantine station in Northern Ireland. Internal Communications.�There are excellent rail and omnibus systems operating in Ulster which ensure comfortable and speedy access to all parts of the Six Counties. Great Northern Railway Co. (I.). (Belfast Terminus, Great Victoria Street) serves the Counties of Armagh, Tyrone and Fermanagh and portions of the Counties of Antrim, Down and Londonderry. This railway links the important towns of Antrim, Lisburn, Banbridge, Lurgan, Portadown, Newry, Warrenpoint, Armagh, Dungannon, Omagh, Strabane, Londonderry, Enniskillen and intermediate stations ; also County Donegal (I. F. S.), via Londonderry or Bundoran Junction. This is the railway by which one reaches Dublin and the South and West of Ireland from the North. London Midland and Scottish Railway (N.C.C.) (Belfast Terminus, York Road), operates in the Counties Antrim, Londonderry and a portion of Tyrone, serving the important towns of Carrickfergus, Whitehead, Larne, Antrim, Ballymena, Ballycastle, Coleraine, Portrush, Portstewart, Cookstown, Castlerock, Londonderry and intermediate stations. Belfast and County Down Railway. (Belfast Terminus, Station Street), is confined to County Down, and serves the important towns of Holywood, Bangor, Donaghadee, Comber, Newtownards, Newcastle, Castlewellan, Downpatrick, Ardglass and intermediate stations. Ulster is exceptionally well supplied with Omnibus Services, and the aforementioned Railway Companies are extensive operators in approximately the same territories as covered by their railway systems. Belfast Omnibus Company, Ltd.�Depot, 128 North Street, Belfast, operate extensive services in the Counties Down, Armagh, Tyrone and Fermanagh, and portions of County Antrim. They serve the important towns of Ardglass, Armagh, Banbridge, Bangor, Comber, Downpatrick, Enniskillen, Kilkeel, Lisburn, Lurgan, Newcastle, Newry, Newtownards, Portadown, Portaferry, Strangford, Warrenpoint, and places en route. Messrs. H. M. S. Catherwood, Ltd.�Depot, Upper Library Street, Belfast, operate in Counties Antrim and Londonderry�week-day service only. They serve the important towns of Antrim, Ballymoney, Ballymena, Ballycastle, Bushmills, Castlerock, Coleraine, Cushendall, Garvagh, Limavady, Londonderry, Portstewart, Portrush, Giant's Causeway, and Strabane and places en-route. In addition they have a service operating in County Down, between Belfast and Newry, to connect with Dublin. Belfast Car Parks.�For Official Car Parking Places, see Map facing page 48. For the first mile or quarter of an hour during which the vehicle shall be kept waiting by the hirer thereof, or for any part of such distance or time, 1/-. For every subsequent quarter mile or 3�minutes during which the vehicle shall be kept waiting by the hirer thereof, or for any part of such distance or time, 3d. Extras� (l) For any number of passengers carried exceeding two for the entire distance, 6d. (2) For each bicycle, perambulator or dog, 6d. (3) For each packet of luggage carried outside the vehicle, 3d. The foregoing fares shall be chargeable within seven statute miles from Castle Place (City centre), and shall apply at all times of the day and night, but shall not operate to prevent any person from making special terms for the hire of a motor hackney carriage for any period of time. The fares shall be indicated by a taxi-meter, the reading of which shall in all cases be taken as correct until the contrary is proved. The L.M.S. (N.C.C.) Railway, York Road, the G.N. Railway, Gt. Victoria Street, the B. & C. D. Railway, Station Street, and the Omnibus Depots of the L.M.S. (N.C.C.) and G.N. Railways, Smithfield, the Belfast Omnibus Co., Ltd., North Street, and H.M.S. Catherwood, Ltd., Upper Library Street, are all situated within one mile radius from the Cross-Channel steamers, with the exception of the G.N. Railway station from the Liverpool steamer shed, which is l � miles. Visitors should bear in mind, however, that waiting time is an extra charge. Complaints should be made to the Executive Officer of the Police Committee, 5 Townhall Street, Belfast (Tel. 5130), who will be glad to investigate immediately. Motoring Organisations.�Automobile Association, 5 Oxford Street, Belfast ; Royal Automobile Club, 65 Chichester Street, Belfast; Ulster Automobile Club, 65 Chichester Street, Belfast. BELFAST NEWS-LETTER, Ltd. (Morning), Donegall Street, Belfast. NORTHERN WHIG, Ltd. (Morning), Bridge St., Belfast. IRISH NEWS, Ltd. (Morning), Donegall St., Belfast. BELFAST TELEGRAPH (Evening), Royal Avenue, Belfast. Important Public Buildings and Places of Interest. Notes regarding Admission. 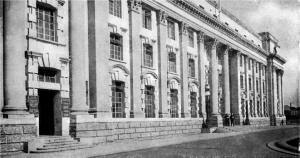 Parliament Buildings�Open first Saturday every month, also last Saturday during summer months, 9-30 a.m.�4-30 p.m. Other Saturdays 9-30 a.m.�12-30 p.m. Ordinary weekdays 9-30 a.m.�4-30 p.m. When the House is sitting 9-30 a.m.�1-30 p.m.
City Hall�10 a.m.�4-45 p.m. Saturdays 10 a.m.�12 noon. Law Courts�June and July 10 a.m.�4 p.m. Saturdays 10 a.m.�12 noon. August and September, 11 a.m.�1 p.m. Saturdays 10 a.m.�12 noon. 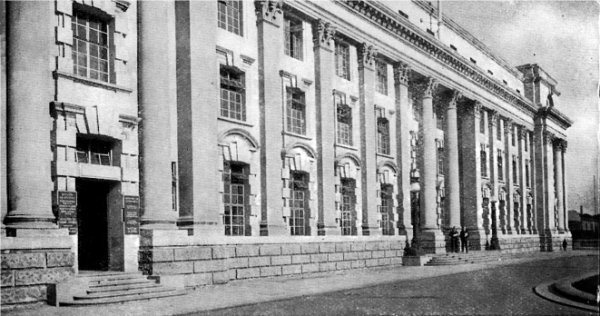 Municipal College�9-30 a.m.�l0 p.m. (except July). Museum and Art Gallery�l0 a.m.�6 p.m. Wed. and Sat.�10 a.m.�9 p.m. B.B.C. Concert every Wednesday 3-30 p.m. Admission free. Public Library�10 a.m.�9 p.m. Tuesday 10 a.m.�I p.m.
Queen's University�Middle of July till middle of September 10 a.m.�4 p.m.
Bellevue and Hazelwood Gardens, the Botanic Gar-dens and other beautiful parks throughout the city are open daily. Round Tower, Antrim�Open daily from 10 a.m.�8 p.m. Admission 1/-. 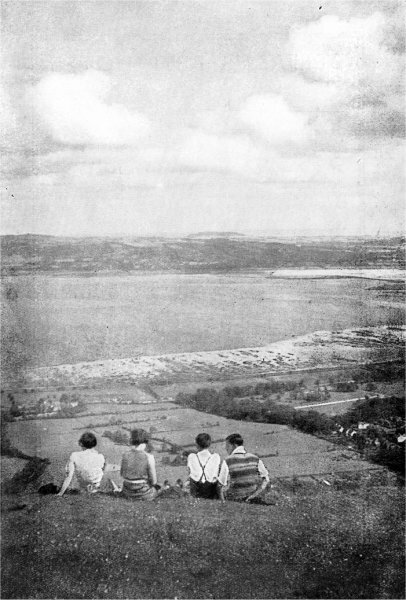 Armagh Observatory�Permission may be obtained from the Rev. W. F. A. Ellison, in residence. Carrick-a-Rede Rope Bridge, Ballintoy�Can be visited daily during summer months. Private toll. Carrickfergus Castle�Open daily. Admission 6d. Dunluce Castle, near Portrush�Open daily. Admission 6d. Crom Castle, Co. Fermanagh�Usually open on Fridays. Devenish Abbey and Round Tower, Enniskillen�Open daily. Admission 6d. Giant's Causeway�Open daily. Admission 6d. Glenariff�Open daily. Admission 6d. Free to holders of return portions of L.M.S. (N.C.C.) omnibus tickets, also circular tour tickets. Helen's Tower�Permission to view granted when shooting not in progress by applying to Mr. McQueen, Clandeboye, Co. Down. Jordan's Castle, Ardglass�Open daily. Admission 6d. Mountstewart�Thursdays and Saturdays 1 p.m.�6 p.m. Admission 1/-. Nendrum Abbey, Mahee Island�Open daily. No admission charge. Silent Valley Reservoir, Kilkeel�Permission can be had from Belfast Water Commissioners, Royal Avenue, Belfast. Shane's Castle, Randalstown�For permission apply to Mr. R. C. Young, Randalstown. The Gobbins Cliffs and Paths, Islandmagee�Open daily during summer months. Admission 6d., unless travelling by rail or L.M.S. (N.C.C.) omnibuses, when return half of ticket secures free admission. The Pottery, Belleek�Inspection by permission of the Manager. The Linen Research Institute, Lambeg�By arrangement with the Director. Gardens.�Under the scheme organised by The Queen's Institute of District Nursing, gardens belonging to prominent residents in Northern Ireland are open to the public on arranged afternoons at a small admission charge. Monthly lists are issued and can be obtained either from this Association or from the Queen's Nurses, 16 Donegall Square South, Belfast. In connection with this scheme a pageant is to be held at Greyabbey on June 12, 13 and 15, 1935. Angling.�Brief references are made throughout the pages of this book, but those specially interested should make application for the Angling Guide issued, free of charge to visitors, by the Tourist Association. Shooting.�For specific information, apply to Mr. N. V. Cooke, Hon. Secretary of the Wildfowl, Game and Fish Protection Society of Ulster, The Ingles, Greenisland, Co. Antrim. Hiking and Rambling.�See chapter dealing with this subject. Further information can he had from Mr. W. M. Capper, Hon. Secretary of the Youth Hostels' Association of Northern Ireland, 501 Lisburn Road, Belfast, from whom the handbook of the Association can be obtained, price 7d. post free. Archaeology and Kindred Subjects.�See chapter on "Ancient Monuments." Further information can be had from Mr. A. Deane (Curator of the Belfast Museum, Secretary of the Belfast Natural History and Philosophical Society, 7 College Square North, Belfast, also from The British Association Guides of 1874 and 1902, available in most libraries, "Ancient Monuments in Northern Ireland," price 1/-, obtainable from H.M. Stationery Office, 80 Chichester Street, Belfast, and " Ulster, its Archaeology and Antiquities," by H. C. Lawlor. Accommodation.�There is ample accommodation in Northern Ireland to suit all tastes, and you are referred to advertisements appearing throughout this Guide. Additional information can also be had from the offices of The Ulster Tourist Development Association or from the Clerks of Council of the towns concerned. Litter.�The Ulster Tourist Development Association appeals most strongly to everyone to refrain from leaving litter of any description lying around. This reprehensible nuisance is a problem engaging the attention of all Local Authorities. It is an unsightly and even dangerous habit which, however, can be completely solved by the public rendering whole-hearted co-operation. Local Guides.�More detailed information regarding the holiday resorts and towns of Northern Ireland can be had free from the Town Clerks concerned, or from the Association's Offices. Local Guides are issued by the Local Authorities of Armagh, Ballycastle, Bangor, Belfast, Carrickfergus, Donaghadee, Enniskillen, Larne, Londonderry, Lur an, Newcastle, Portrush, Portstewart, Strabane, Warrenpoint and Whitehead. Slides.�A complete set of lantern slides of Ulster scenery, together with notes on the slides, can be obtained on application to the Association's Offices, Belfast, or from Messrs. Thos. Cook & Son's Offices at Morgan Trust Building, 1455 Union Avenue, Montreal; 232 Bay Street, Toronto ; 587 Fifth Avenue, New York ; 269 Collins Street, Melbourne, C.I., and from the Ulster Association, Terrica House, Adelaide Street, Brisbane. Sets can be had also from the Managers of the Railway Companies operating in Ulster. List of Events.�A List of Coming Events taking place in Ulster is compiled by the Tourist Association, and a copy is enclosed in this Guide. Souvenir Photographic Brochure. � This attractive publication of views can be had from the Association's Offices. Price 6d. Photographs.�Readers in possession of good photographs taken in Northern Ireland are invited to submit them to the Association for consideration with a view to purchase. Suggestions or Criticisms.�The Association would welcome practical suggestions as to how its literature could be made even more comprehensive by the inclusion of additional information of interest to visitors. B. & B.�Bed and Breakfast. MIDLAND STATION HOTEL. B. & B. from 11/6. IMPERIAL HOTEL. B. & B. from 7/-. Where Daily Rate is quoted, same is offered for a stay of not less than one week. Meals served in Bed or Sitting Rooms are subject to 25 per cent. increase. Intending visitors are advised to give earliest possible notice to Hotel they intend to patronise.